1) Why do mathematicians confuse Halloween and Christmas? 2) At a recent conference on logic there were 600 attendees and only one toilet facility. What “common or garden” compound logical sentence, or proposition, may be validly inferred? thanks to Mark Heath for permission to use his cartoon. 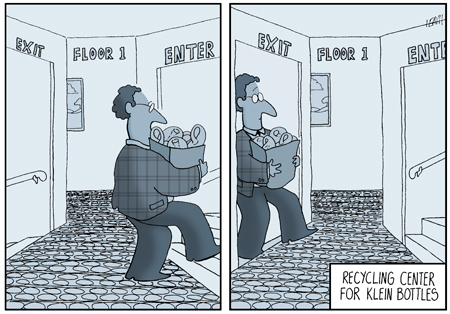 I didn’t think that klein bottles existed, now I’m not so sure.